The air washer, essentially consists of rows of nozzles inside of the camera or on the casing. Atank at the bottom of the camera enables to collect the water as it falls through the air and shall come into intimate contact with the wet surface of the chamber walls. Water is mainly spread by means of a pump, warm water is passed through the cooling coils or pieces of ice to cool before being passed into the spray booth. Loss of water through evaporation, as a rule, automatically replaced by the use of float organization that recognizes the water from the main tank, as required. In many places the water is sufficiently great to use because it comes from a source. In other places the water is not cool enough and must be cooled with ice or with a refrigeration machine. The main functions of the air washer for cooling air passed through the spray chamber and humidity control. In many cases, cooling coils are located at the bottom of the spray chamber, so that the warm spray descends, it is cooled and ready again sprayed by a pump. In some cases, water is passed through a double-pipe arrangement and is cooled by the counter-current principle. Fig. 3-14 shows a preview of the air filter. In this case, spray pipes are installed vertically. In some cases, spray pipes horizontal, so that the spray down-directed. 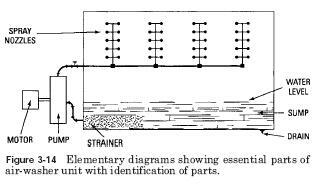 And some smaller water particles, as a rule, are carried together with the air flow, series of curved plates or partitions, as a rule, is used, which makes cool and humidify the air to change the direction of flow, throwing or elimination of water particles in the process. Automatic expansion valve Cross charge sensing bulb Effect of moisture in refrigeration system Efficiency of condenser Furnace ladder diagram Mop valve Motor winding Psychrometric chart R22a pressure temperature chart Temperature glide Two stage centrifugal refrigerant compressor Viscous air filter Why to burn the refrigerator compressor?